But within just a few months the sub-compact SUV segment has exploded, with the Ford EcoSport, Holden Trax, Peugeot 2008 and Suzuki S-Cross all in the last few months joining the Nissan Juke and Mitsubishi ASX as sub-$27K SUV alternatives. All include a high driving position and pram-loading versatility within bodies that measure between 4.1 and 4.3 metres, and all contenders here have four-cylinder engines ranging from 1.6 to 2.0 litres without turbocharger assistance. Given almost all buyers in this segment choose an automatic transmission, it’s our core entry criteria. The least expensive equivalent base- or mid-range models are the $24,290 Ford EcoSport Trend and the $100-dearer Nissan Juke ST. The only EcoSport that could be supplied, however, is the flagship $27,790 Titanium version, but it is identical to the Trend with the exception of leather trim and climate control. Neither base model gets a satisfying level of standard equipment. Both the EcoSport Trend and Juke ST lack a reverse-view camera and rear parking sensors, for example. Over the Ford, the Nissan gets a leather ‘accented’ steering wheel, climate control, fog lights, and 17-inch alloy wheels. It isn’t much of a stretch to the $24,990 Peugeot 2008 Active 1.6-litre automatic, which is far better equipped than the Nissan and Ford. It combines everything they each have standard with the exception of climate control, and 16-inch alloys are a size down on the Juke’s 17s. But the 2008 Active further adds a seven-inch colour touchscreen and, crucially, a standard reverse-view camera. Peugeot could only supply a $29,990 1.6 Allure automatic, however it is mechanically identical to the Active and adds dual-zone climate control, satellite navigation and a panoramic sunroof that can easily be ignored here. The leather trim and front heated seats fitted to our test car push the Allure’s price up by another $2000. The $25,490 Holden Trax LT 1.8-litre automatic misses the foglights of the Juke and 2008, and the climate control standard in the former. 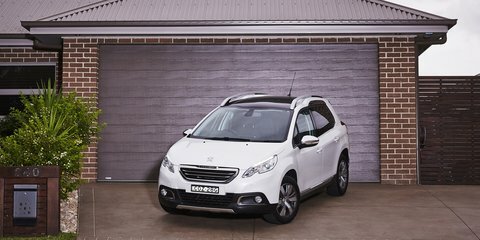 To the equipment standard on the Peugeot, the Holden adds rear parking sensors (in addition to a reverse-view camera) and mobile internet capability with app integration to utilise music streaming facilities such as Pandora. It’s also the only base model to score auto on/off headlights. 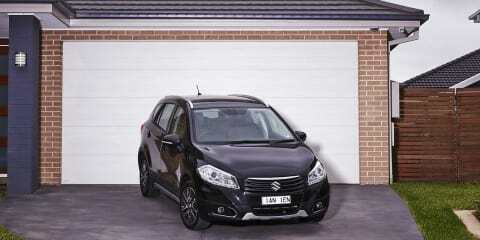 For the same price as the Trax, the Suzuki SX4 S-Cross GL appears spartan. There’s no reverse-view camera or parking sensors, no foglights or leather wrapping for the steering wheel, and only 16-inch alloy wheels. Suzuki could only supply a flagship $34,990 GLX Prestige variant, which includes leather/fogs/sat-nav/panoramic roof but mechanically only adds all-wheel drive over the base front-driver. The $26,990 Mitsubishi ASX 2WD may be the most expensive car here, but it at least gets 17-inch alloys, if not fogs, and matches the Trax’s camera-and-sensors combination and leather-wrapped steering wheel. It also includes climate control to match the Nissan. Only $2700 separates the six offerings in their base specification, but a larger wedge is put between them for servicing costs. It’s simple for the Holden Trax. Every 12 months or 15,000km a $185 service is required, resulting in a $555 total over the first three years or 45,000km. It costs a bit more to keep a Ford EcoSport or Mitsubishi ASX running over the same distance and time, at $220 and $250 per check-up for $660 and $750 totals respectively. Those figures are almost half that of the Peugeot, which asks $369 for each of the first trio of workshop visits and $1107 all up. Both the Nissan Juke and Suzuki SX4 S-Cross, meanwhile, need six-month or 10,000km servicing. Not only is taking your car to a dealer twice in a year more time consuming but both charge more as well. To reach three years the Nissan costs $1639, the Suzuki $1540. Should you make the 50,000km count before the time interval, you’ll save a service and $277.94 off that Juke total, and $249 off the S-Cross’s, to bring them a bit closer to the Peugeot. That other long-term running cost – fuel – hurts the Holden. Its 1.8-litre four-cylinder petrol engine is the second-largest here after the 2.0-litre Mitsubishi, but both are the heaviest cars on test, at 1375kg (Trax) and 1355kg (ASX). That’s a staggering 238-258kg weightier than the 1113kg Peugeot 2008 (the lightest car here), which gets a smaller 1.6-litre petrol engine. Had we been given the base front-wheel-drive Suzuki SX4 it would have weighed even less, at 1085kg, but our all-wheel-drive flagship variant tips in at 1190kg. Both it and the 1kg-heavier Juke ST get the same-size engines as the Peugeot. The upshot is while the ASX makes 110kW of power at 6000rpm and 197Nm of torque at 4200rpm, and the Trax produces 103kW at 6300rpm and 175Nm at 3800rpm, the 2008 makes a lunge at both for power- and torque-to-weight ratios. The 2008 makes a lesser 88kW at 6000rpm and 160Nm at 4250rpm, but with all things equalised its 79kW per tonne beats the 75kW Trax and almost matches the 81kW ASX. It’s the same for torque, with the Peugeot’s 144Nm per tonne only 1Nm behind the Mitsubishi and well ahead of the Holden’s miserly 128Nm. In fact, for torque-to-weight the Trax is even eclipsed by the Juke and S-Cross. The Nissan makes the same power at the same revs as the Peugeot, and 158Nm at 4400rpm; the Suzuki delivers 86kW at 6000rpm and 156Nm at 4400rpm. That translates to 74kW/133Nm per tonne for the Juke, and 72kW/131Nm for the S-Cross. The Ford? Best to look away now. The baby 1.5-litre makes respectable totals – 82kW at 6300rpm and 140Nm at 4400rpm – but the EcoSport is no lightweight, meaning disastrous equalised figures of 64kW/109Nm per tonne. There’s little need to check the figures after driving these sub-compact SUVs. 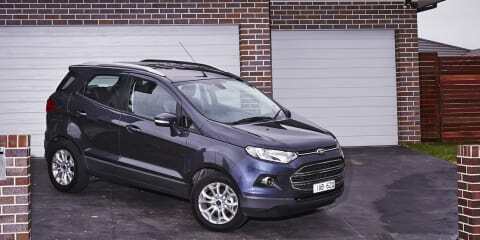 The Ford feels strained, its six-speed dual-clutch automatic working in a frenzied mess to keep a set speed. There’s little sound deadening so it’s noisy, too, in addition to being frustratingly slow. Not that the EcoSport has a single hold on slowness. The S-Cross and Juke both get an automatic continuously variable transmission (CVT), except only one of them is good. The Suzuki’s CVT chases economy to the detriment of driveability and refinement, slurring to 1200rpm after even small throttle lifts, which sends vibrations through the steering wheel and makes the car feel like the engine has dropped out. The doughy throttle then needs to be pounded just to keep up with city traffic. Switching to ‘Sport’ mode raises revs and improves response, which is good, but it makes the throttle too touchy for smooth urban driving, which is bad. It’s not available in the entry 2WD variant anyway. There’s a sizeable contrast to the Nissan’s CVT, which is quick to respond to light throttle presses, and determinedly keeps the little engine working hard so the Juke feels … less slow. Its Sport mode is much more finely calibrated than the Suzuki’s, but it too is mandatory to make the throttle/engine relationship feel satisfactory. The only other car here with a CVT – the Mitsubishi – splits the difference, by being perfectly adequate but nothing more. Thanks to the extra torque, the ASX is noticeably more relaxed on hills both around town and on the freeway, even if it ultimately feels no quicker in a frenetic school-run traffic light drag. The engine is even noisier than the none-too-quiet engines in the Juke and S-Cross. A comparative haven of calm exists in the Holden and Peugeot. The 1.8-litre Ecotec motor in the Trax dates back to the 1990s, although it feels more potent and is quieter than the engines in the ASX, Juke, S-Cross and EcoSport. Unfortunately, the six-speed automatic slurs and hunts wildly, and in town defaults to tall gears the engine can’t cope with. On moderate hills, the auto will hold one lower gear but no more. It’s surprising that the four-speed automatic in the Peugeot actually partners more fluently with its engine than the six-speed Holden and Ford, and CVT-equipped S-Cross. That’s partly because the 1.6-litre engine feels the strongest here, although it isn’t characterful. The automatic suffers shift-shock on full throttle kickdowns – where the car lurches its occupants forward when changing gear – and at really low speeds on hills around town it frustratingly bogs down in second. But out in the country the Sport mode actually flicks back a gear or two under hard braking and adeptly holds a lower ratio where the Holden (and Suzuki) will slur up. Still, Peugeot, four gears in 2014? It’s not 2008 (ahem). It’s little surprise that the Nissan, among the lightest here with the best transmission, was the thriftiest across a 500km freeway and country-road test loop. 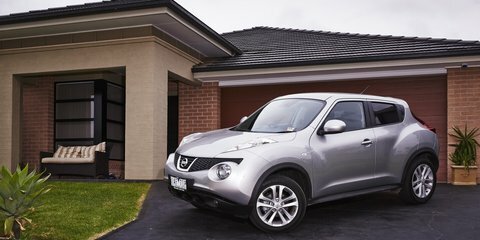 The Juke recorded 8.6L/100km, up from its 6.3L/100km combined cycle claim. The relatively torquey Mitsubishi and petite Peugeot took equal second, each posting 8.8L/100km (up on respective 7.7L/100km and 6.5L/100km claims). The overworked Suzuki and Ford returned in the nines (9.1/9.2L/100km respectively, up on 5.8/6.5L/100km claims) while the Holden guzzled a disappointing 10.5L/100km (up from 7.6L/100km). Over the 15,000km Australians drive on average each year, and with unleaded at $1.50 per litre, the Holden will cost $2363 to fill compared with $1935 for the Nissan. That’s a $1283 saving after three years ownership, and enough to offset the Juke’s higher servicing costs and put the Nissan driver back in front by $199 over that period. The Holden and Nissan again swap places for cabin comfort. The Trax has the best front and rear seats here, broad and supportive, although it only narrowly eclipses the softer, smaller pews in the 2008. Up front the ASX has beefy side supports on its side and a wide base, but the rear bench is flat and too firm. The same is true for the S-Cross, which also gets flatter front seats. All four are miles ahead of the EcoSport and Juke for seat comfort. The Nissan is better up front, with the Ford offering absolutely no side support and a thin and comfortable base, not to mention vinyl-like trim on this Titanium grade. But at least the EcoSport’s rear bench reclines – the only SUV here to do so – and is set high for good visibility, where the Juke’s has a short and flat base and is perched low. The Trax also has the most interior room of the bunch, and a high-set rear bench means the lanky can stretch their legs out further. The Holden offers the most space under the front seats as well, and is the only car here with a powerpoint behind the centre console to power a laptop, for example. The 4295-millimetre-long ASX is 17mm longer than the Trax, and the Mitsubishi exactly matches the Holden’s 270mm of rear legroom behind the driving position of a 178cm male. The Suzuki is the longest car here, stretching 5mm further again, but includes 250mm of rear legroom and – partially thanks to a panoramic sunroof – the equal-poorest headroom of the bunch. The latter dishonour is shared with the Nissan, which gets the least rear legroom (210mm) here. The EcoSport may share that lack of back-seat stretching space, but it’s the shortest car here from tip-to-toe at 4010mm, a full 125mm less than the Juke. The Ford also has stacks of headroom and foot room under the front seats, where the Nissan does not. The most efficiently packaged contender here is the Peugeot. At 4159mm long, compared with the Holden and Mitsubishi it is 119mm and 136mm shorter respectively, yet it offers only 10mm less legroom (at 260mm) and plenty of headroom and foot space. The 2008 also trumps the Trax for boot space – 410 litres versus 356L. The ASX is only marginally larger (at 416L) while the S-Cross beats all with a 430L area. Meanwhile the EcoSport (at 346L) almost matches the much-larger Holden, leaving the Juke (at a paltry 246L) last by a mile. The 2008 has the nicest interior here, too. Beyond the leather trim and climate controls of this higher-grade Allure, even the base Active gets the intuitive and high-resolution touchscreen and neat silver accents on the proper door grabs and dashboard. The tiny steering wheel works a treat, and for all drivers on-test it didn’t obscure the high-set dials as it does in the 208 hatchback. Shame there’s no footrest, though. The Holden comes close to matching the Peugeot for interior quality, with nicely textured hard plastics and decent finish. The Trax wins the award for best connectivity here, matching the 2008’s seven-inch screen but offering an even more intuitive interface with apps availability. The Suzuki cabin is well-finished and the textured soft-touch panel strip across the dashboard is among the nicest of any single cabin feature here. It’s standard across the range, too, though the touchscreen interface is replaced by a dowdy monochromatic audio display in the base GL, and ordinary air-conditioning controls and a plastic tiller further drag the entry S-Cross’s score down. Lashings of soft-touch plastics, a leather-trimmed wheel and chrome touches lift the ASX’s interior compared with the pre-facelift model that launched in 2009, but the design feels otherwise aged. The touchscreen offers poor usability, and the hard lower plastics and sticky climate controls don’t feel high quality. That said, the cloth-trimmed lid of the centre storage bin opens to reveal the largest centre cavity here. The Nissan’s hard plastics and tiny low-resolution colour centre screen date it even more so than the Mitsubishi. At least everything is well put together, however, which is more than you can say for the Indian-built Ford. Not only are the plastics the worst here, but they emit an awful smell and fit together poorly. This is clearly a cabin designed for emerging markets but hastily rushed into mature markets such as Australia. Small SUVs should arguably prioritise ride quality over dynamic prowess. Consider it a bonus, then, that the Peugeot 2008 is genuinely fun to drive in addition to being smooth riding and quick-steering. It’s the only car here to feel light on its feet, and its connection through its tiny tiller makes the French SUV as enjoyable around town as it is on the open road. Crucially, however, it also absorbs large bumps adeptly, even if some smaller irregularities filter through to the cabin. 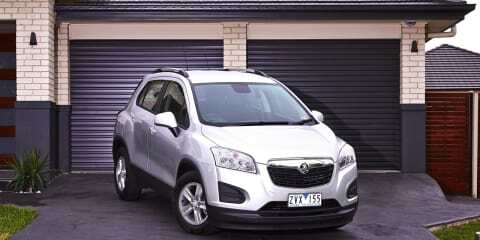 Ultimately, the Holden Trax is sharper than the 2008. It sits flatter, is similarly well balanced, and has grippier Continental tyres (versus the Peugeot’s Goodyears). With a 70-aspect ratio, however, the chubby rubber should also help the suspension deliver a ride to rival the Peugeot. But the Trax is fidgety around town, and jars slightly between the concrete slabs of urban arterials, although its rough-road control at speed is impressive. The Nissan Juke runs both the 2008 and Trax close. Its steering is light and direct, eclipsing the Holden’s that is reactive on-centre then too light either side of it, but it can’t match the Peugeot’s that is pointy yet never nervous. The Nissan’s handling resembles the way it looks – wide and low, it attacks corners like a bulldog, sharp at the front end and gripping at the rear – but the ride is very firm and the suspension noisy. If the Juke and Trax duel as the sharpest handling cars here, then the S-Cross sides with the 2008 as the softer alternative. Quite simply, though, the Suzuki’s balance is impeccable. The way it plays between its axles – pushing at the front, bringing the rear around with a lift of the throttle – is more the reserve of a sporty hatchback than SUV. That’s probably no coincidence, because the low driving position of the S-Cross feels the most car-like here. Shame, then, that its ride is more Trax-like than 2008-like, and neither the soft brakes nor the notchy, vague steering back the brilliant dynamics. 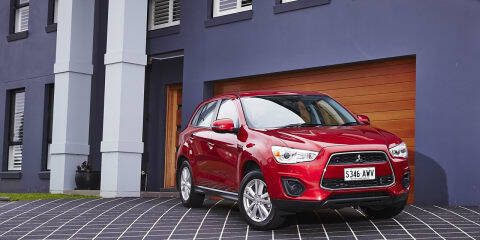 The Mitsubishi ASX and Ford EcoSport neither ride nor handle well. The EcoSport at least has typical-Ford smooth and mid-weighted steering, where the Mitsubishi’s is dreadfully slow and incredibly vague all over. If the bulldog Juke handles the way it looks, though, then so does the tall and skinny EcoSport. Turn into a corner and its tippy-toe disposition never feels planted; push too hard and it lacks balance and feels precarious. Meanwhile the ASX feels soggy and understeery. It has little in the way of chassis balance, though it feels more planted than the Ford. Both the ASX and EcoSport disappoint with thumpy and unsettled ride quality, too. Space-efficient, classy inside and great to drive, the Peugeot 2008 wins this contest. It just needs a better transmission and ideally a more refined engine to be a truly great little SUV. The Holden Trax runs the French SUV surprisingly close, and in maximising outright space and connectivity capabilities it is a solid alternative. From here the talent level dips, and positions three to five are harder to sort through. Last place is reserved for the Ford EcoSport that feels and drives like the cheapest car here, although the manual-only 1.0-litre turbo Ecoboost is a much more convincing package. Of the rest, the best SUV to sit in and drive is the Suzuki S-Cross, but bargain hard because it is expensive. The Mitsubishi ASX is an average drive, but at least it’s well equipped and roomy, which is enough to push it into fourth ahead of the cramped but finer-driving Nissan Juke. If the priorities for buying a sub-compact SUV are spending less than $27,000 and squeezing in tight city parking spots then the 2008 and Trax are the best options. However if the budget (and body length) can stretch a little further then the size-larger Volkswagen Tiguan, Subaru Forester and Mazda CX-5 are worth a look.